This 6' fence provides safety and privacy for the pool. This fence looks the same on both sides. 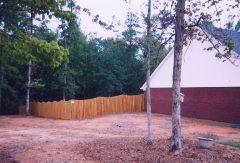 A 6' wooden privacy fence separates a nice backyard from a barren sideyard. 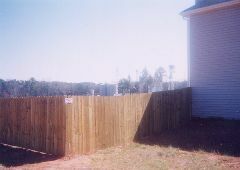 This 6' wooden privacy fence is ideal for the separation between properties, while providing for privacy. How much more elegant can you get? Copper tops with concave scallops. 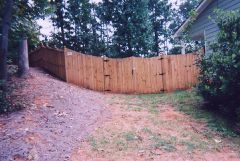 Here is a privacy fence with a double gate to provide both privacy and access. 6 x 6 posts with concave or convex scallops creates a bold look. 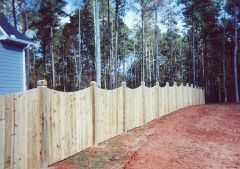 If you ever thought that wood might not be for you, then try this double-sided fence with style. 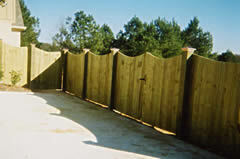 A shadow box wood fence will provide gorgeous semi-privacy while still allowing breezes to flow.